Silurian bases its appearance on early photographs of the now defunct border morris side from the village of Upton-on-Severn, near Malvern, Worcestershire. 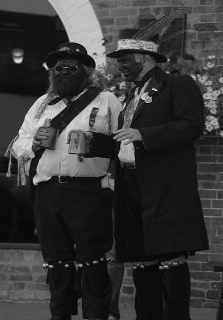 The true origins of the blackened face are lost in the mists of time, but are widely believed to be simply a form of disguise, possibly to overcome the oppressive anti-begging laws of the 17th century, and the timeless embarrassment of being a morris man. Despite the attempts of the politically correct 20th century to imply otherwise, the blackened face has no known racist origins. Silurian has found the black face to be an effective aphrodisiac for female members of the audience, and now routinely blacken their faces before going to bed. As Welsh Border Morris was generally danced during the winter (when work was scarce and beer money in short supply), the kit is clearly designed for that season. It comprises a black bowler hat, black tailcoat and black trousers, with a white shirt with strips of coloured rags sewn on. 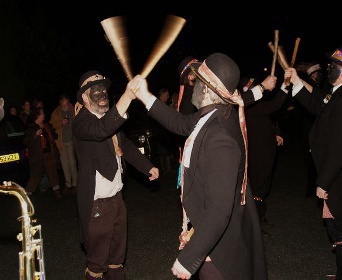 Each dancer then wears a coloured sash across his shirt, with a matching ribbon in the bowler hat and around his knees, to which the bells are attached. The delightful appearance is completed with a pair of Dr. Martin's boots, or equivalent.